Frankford Machinery, a family owned business, has been servicing and distributing equipment to the dry cleaning, laundry and hospitality industry for many years. In the years past, we at Frankford have overcome many adversities extending from several economic recessions to the ever-changing government regulations pertaining to the dry cleaning industry. Through our experiences, we have seen manufacturers and distributors rise and fall, yet we continue to succeed. 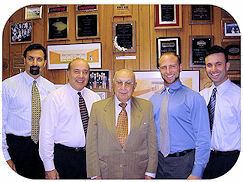 Our success is simply attributed to our long-lasting dedication to our customers and the industry. Today we are the #1 distributor in Philadelphia and continue to provide our customers in Philadelphia and the surrounding area the finest equipment and best service. Whether you are interested in starting a new business, replacing equipment or looking for parts, our staff is ready to serve you. "It is estimated that the drycleaning and laundry industry employ over 200,000 people nationwide including managers, launderers, pressers, machine operators, sales and service clerks and related allied trade personnel. The industry prides itself on the diversity of its workforce with approximately 2.5 billion in payroll nationally." Call 215-289-3434, and be sure to check out our online parts department at www.frankfordparts.com. Copyright 2011 Frankford Machinery, Inc.. All rights reserved.